Now that your vacation dates are reserved, here are some packing hints. 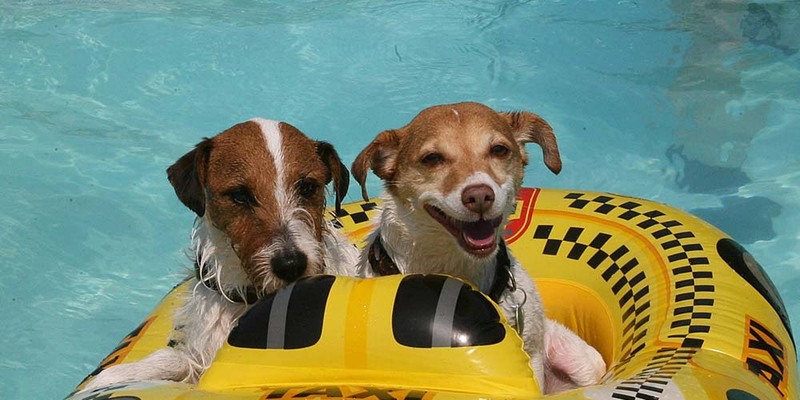 We invite you to bring whatever makes your pup comfortable during their stay. The suites have stone heated floors, textured walls on 3 sides, and a custom build gate on the front. Suite sizes range from 4’x4’x9’ tall to 6’x12’x9’ tall. Suite sizes are assigned based upon dog size, ability to have one of our beds, and lead time of reservation. Several suites have windows. The building is fully air-conditioned and air purified. There is soft lighting and music 24 hours. Bedding is provided – custom made wrought iron bedframes with plush mattresses and upholstered covers. Alternatively, if you choose to, or if your dog is a destructive chewer, you can opt for no bed or to bring your own. Feeding – We ask you to bring your dog’s food so that we can maintain their own diet while with us which minimizes intestinal upset. We do not require pre-packed food and we welcome all diets, including raw, or a prepared homemade diet. Please bring the appropriate amount based upon the length of stay, along with a little extra in case your trip is extended. While we have storage space, it is somewhat limited. We ask that you provide feeding amounts in standard measuring cup and measuring spoon amounts. You do not need to bring bowls unless your dog requires a raised or slow-feed bowl. Medicines – We do not charge extra for administering medicines / supplements. We prefer medicines in their individual containers and not mixed in with the food. Many dogs will spit pills out and to ensure that they receive their meds / supplements, we will give them in a little peanut butter which we have in stock, or whatever medium you bring along. We can also pill dogs if necessary. If you prefer to use a pill planner, that is OK as long as the meds for each meal are in separate sections of the planner and we have a list and description of each med for identification to avoid confusion. We clearly list medicines on our feeding forms in case we need to seek medical attention for your dog, so that we can communicate current medications with the veterinarian. Please also note that controlled substances are kept at the manager’s desk and if you bring a large bottle of pills, the managers need to take a count of the pills both AM & PM. A smaller supply is recommended with a few extra in case the vacation is extended. Collars / Leashes – Please make certain that your dog has a leather or nylon collar with a name tag for easy identification while in play. We ask that you do not bring chain collars as they can be hazardous for more active players. Collars will be removed at bedtime. Typically we send leashes home with you and use our own while your dog is with us. We can keep leashes with your dog’s inventory if you prefer. Coats – Feel free to bring a coat for your dog if they require one for play. We do have a selection of coats / sweaters here and will use them if we feel it would be beneficial for your dog. Our goal is to give them as much outdoor play as they enjoy and when they are active they typically stay warm. Modified play time for warm up break, meals, naps can be scheduled based upon your wishes. We also have an indoor play room for cold weather days. Other items –We give our guests a fresh-baked “yappy hour” biscuit when they come in from play and a biscuit at bedtime. You are welcome to bring your own treats for those dogs with allergies or sensitivities. Additional treats can be scheduled as well. For chews, bully sticks, bones, etc., as long as your dog can have the item un-attended you are welcome to bring them. Please note that whatever you bring, gets inventoried . . . right down to a receipt in a bag, so that we can make certain whatever you bring is returned to you. That being said, it is very time and labor intensive with large amounts of inventory which detracts from time spent with your best friend. So, we encourage you to bring whatever will make your pup’s stay comfortable but keep in mind that our priority is to spend the maximum amount of time with your dog and not inventorying belongings. Laundry – It is our practice, as a courtesy, to wash blankets, beds, toys before departure. As long as they can be disassembled and will fit in our washing machine. Please advise us if you prefer that we not wash your belongings. However, if your dog has an accident, we will wash what we can. We are excited about your dog’s vacation!